> Finland, a place of oddities and wonders, and the beginning of my spring break. While in Helsinki, the capital of Finland, I saw many a thing, but only a few are noteworthy. First and foremost, it is a city similar to Milan or Trieste, full of new life, new buildings and stores. It has large department stores and huge malls. The best story about Finland though, lies in its most trivial of places, the tourist shops. Unlike most big cities, Helsinki does not have a booming tourism industry, but there are a few shops here and there. 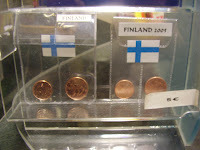 Finland, as is well known, is on the euro, but unlike other places they do not use the one or two cent coins. Instead, at each tourist shop and airport, they put these in little bags together and sell them for 3, 5, or even 8 euros. (in photo at left) What a country! Finland is a strange place and because of some disheartening events I will most likely choose not to return. Leaving Finland, I went on to my final destination of Istanbul, once called Constantinople. This fantastic place is worth at least four or five days. 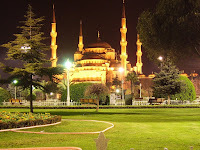 They have many large beautiful mosques such as the Blue Mosque (in photo below) or Aya Sofia, and many fun museums too. They even have a royal palace that is filled with glitter and amusement, but the best part of Istanbul is their wondrous Grand Bazaar. The Grand Bazaar is one of the most interesting and fun places I have ever experienced. I felt like royalty as every merchant and business man approached me with an offer of some sort, ready to drop the price much lower than expected. It is a game, a constant game of wits and skill. Will they win and fleece you of a few extra dollars? Or will they get desperate and anxious enough to sell it to you for less than they had intended? After going through the sixty-five streets of numerous goods ranging from clothes and normal items to marvelous chess sets and seemingly priceless artifacts, I took a Turkish Bath. This is the other must-have experience of Istanbul, a process of the best massages, saunas, steam rooms, and scrub downs that left me feeling entirely refreshed and ready to do anything. Every muscle in my body was relaxed. So I left the Turkish Bath with a smile on my face and headed over to a candy store to have some Turkish delights such as Lokum and then some baklava. These are the treasures of Istanbul and the joys of my spring break.